You can probably tell by the title whose turn it was to pick the topic this week (insert appropriate emoji here). So we are doing cracker jokes? Really? Ok…! Here goes! 5. What do you get if you cross Santa with a duck? – A Christmas Quacker! 4. How does good King Wenceslas like his Pizzas? – One that’s deep-pan, crisp and even! 3. What do you get if you eat Christmas decorations? – Tinselitis! 2. What do you call a bunch of chess players bragging about their games in a hotel lobby? – Chess nuts boasting in an open foyer! 1. Why is it getting harder to buy Advent Calendars? – Because their days are numbered! Wow. Those are some terrible (and I mean TERRIBLE) jokes!! 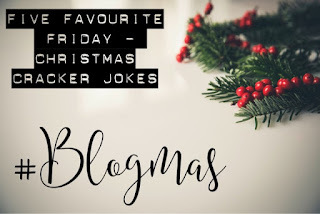 I really hope you enjoy this Christmas Five Favourite Friday! As always head on over to Tim’s blog to read his post. Next Post #Blogmas | Christmas Eve!